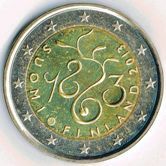 Finnish Euro Coins are very appealing to collectors - delightful motifs both for the standard coins as well as for the Commemoratives - of which Finland has issued more than any other country. 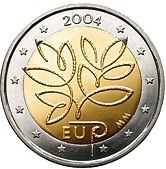 Finland was one of the founding members of the Euro zone and started issuing coins in 2002. Some basic facts relating to Finland. 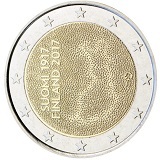 Finnish Euro Coins consist of three motifs - one for the "cent coins"(1 cent, 2 cent,5 cent, 10 cent,20 cent and 50 cent) and one each for the one Euro and two Euro coins. 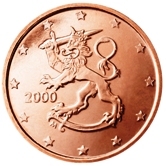 Heraldic Lion (1 cent to 50 cent) coins. 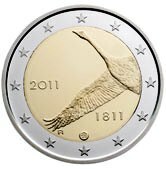 Swans flying over a Finnish landscape - 1 Euro Coin. 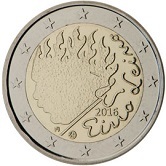 Fruit and leaves of the Cloudberry (Molteberry) - 2 Euro Coin. 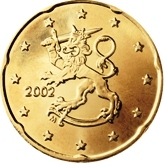 The heraldic lion has often been the motif on Finnish coins and also appears on the Finnish Coat of Arms. The lion is shown brandishing one sword while trampling on another (presumably that of the enemy). Two swans are shown flying over a typical Finnish landscape. The Whooper swan is the Finnish national bird. 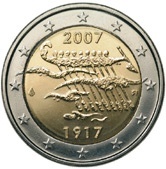 Molteberries (Cloud Berries) are depicted on the 2 Euro coin. 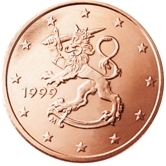 The "copper coins" are not much used in Finland, particularly the 1 cent and 2 cent coins. 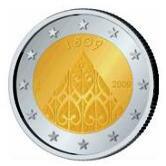 They are only minted as this is a requirement of the European Central Bank. The main reason is that in Finland if one purchases with cash, the final sum is commercially rounded to the nearer 5 cents. 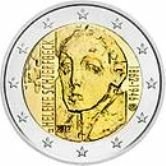 This has resulted in there being relatively few copper coins in circulation and if one buys them from a dealer, they are generally more expensive than most of their counterparts from other Euro countries. In 2007 at the same time as the new common side was introduced, a revised national side appeared - the changes however were few. 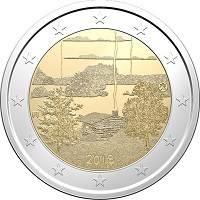 The logo of the Finnish mint now appears between eight and nine o'clock, while FI (signifying Finland) has replaced the initials of the governor of the central bank. It appears at five o'clock. In 2008 the "national side" was again revised. 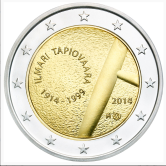 The logo of the Finnish mint now appears further in - i.e. no longer on the outer ring. 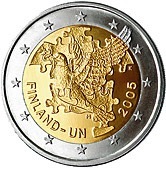 The logo of the Finnish mint was changed in 2010 and this is reflected in coins minted from 2011. 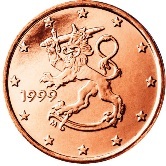 1 cent - Heraldic Lion. 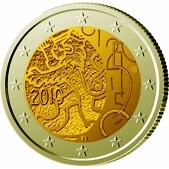 2 cent - Heraldic Lion. 5 cent - Heraldic Lion. 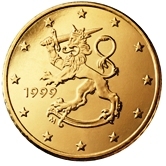 10 cent - Heraldic Lion. 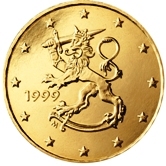 20 cent - Heraldic Lion. 50 cent - Heraldic Lion. 1 Euro - Swans flying over Finnish landscape. 2 Euro - Molteberry (Cloudberry) showing fruit and leaves. 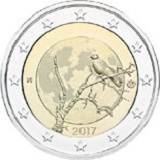 Around the rim of the Two Euro Coin is inscribed "Suomi Finland" (this is Finnland in Finnish and Swedish) as well as three Heraldic Lions. 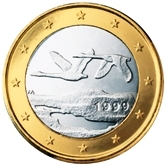 Finnish Commemorative Two Euro Coins. 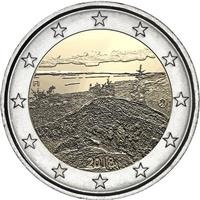 Finland is one of the two countries (the other being Luxembourg) to have issued commemorative coins of its own for every year since the commemorative issues started in 2004 and as all of them are attractive, coin collectors have good reason to be grateful to Finland! 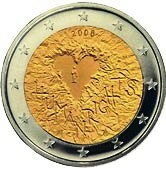 2004 - This represents the 5th enlargement of the European Union. 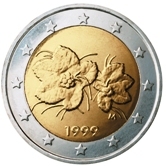 The stylized flower has 10 buds - one for each of the states that joined the EU in 2004. 2005 - 60th anniversary of the grounding of the United Nations as well as the 50th anniversary of Finlands membership of the United Nations. 2006 - 100th anniversary of the enfranchisement of women in Finland. 2007 - 90th anniversary of Finnish independence. 2009 - 200th anniversary of Finnish autonomy. 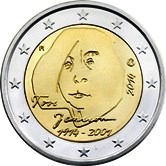 2010 - 150th anniversary of Finland having its own currency. 2011 - 200th anniversary of the bank of Finland. 2012 - 150 th anniversary of the birth of the painter Helene Schjerfbeck. 2013 - 150th anniversary of the parliament of 1863. 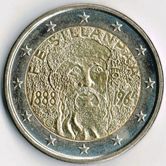 2013 - 125 th birthday of Frans Eemil Silanpää. 2014 - 100th Birthday of Toves Janssons. 2014 - 100th Birthday of Ilmari Tapiovaara.To the left are the artist's name plus birth and death dates. To the right is a furniture segment typical of the artist. 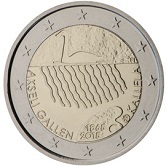 2015 - In honour of Akseli Gallen-Kallela, a famous Finnish painter, architect and designer. 2016 - 90th anniversary of the death of Eino Leino,a famous Finnish author. 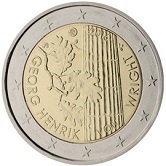 2016 - 100th anniversary of the birth of Henrik von Wright, a Finnish philosopher and logician. 2018 - Koli National Park. 2018 – Finnish Sauna Culture. 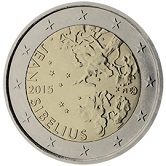 Return from Finnish Euro Coins to Links to Specific Countries. 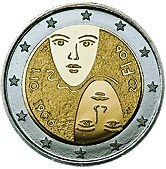 Return from Finnish Euro Coins to euro coin collector.